Can You Tell The Actors From "The Crown" Apart From The Royal Characters They Play? Can You Tell The Actors From “The Crown” Apart From The Royal Characters They Play? The Crown debuted on Netflix in 2016 and became an instant hit. Based on the rule of Queen Elizabeth II, the lavish series mimicked its subject matter with intense accuracy. We wouldn’t blame anyone who thought they were watching a historical recording! The actors cast to play the Queen, Winston Churchill, and Prince Phillip among others are perfectly disguised in their roles. As you go through this list, see if you can identify which picture is the actor and which is the real person. It’s not as easy as it sounds! 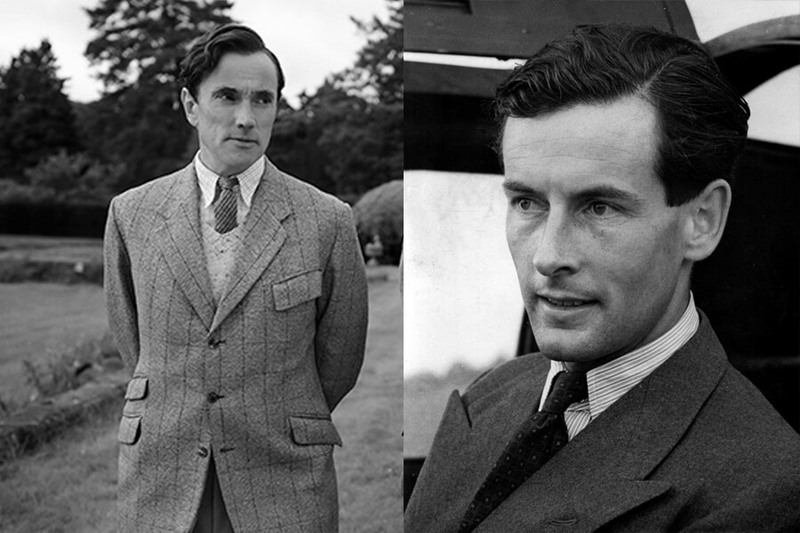 From 1944 until 1953, Peter Townsend served as Equerry to King George VI and Queen Elizabeth II. During his time with the Royal family, he also had a romantic relationship with Princess Margaret. Born in 1914, he died in 1995 at 80 years old. Can you tell which one is the actor and which one is Peter Townsend? If you said the man on the right is the real Townsend, you’re correct. Ben Miles is as close to a replica of Townsend as you can get, though. Aiming for authenticity, The Crown knocked this one out of the park! When Claire Foy was announced as Queen Elizabeth II, people had their doubts. Looking at the comparison above, it’s clear those concerns were overblown. Foy wasn’t worried about playing the Queen, either. What she was worried about was pronouncing a certain word correctly. As the actress on the right puts it, “Weirdly, the word that came up a lot was ‘house.’” Foy says the Queen’s accent is so specific that a dialect coach needed to be brought in so she could say certain words correctly. 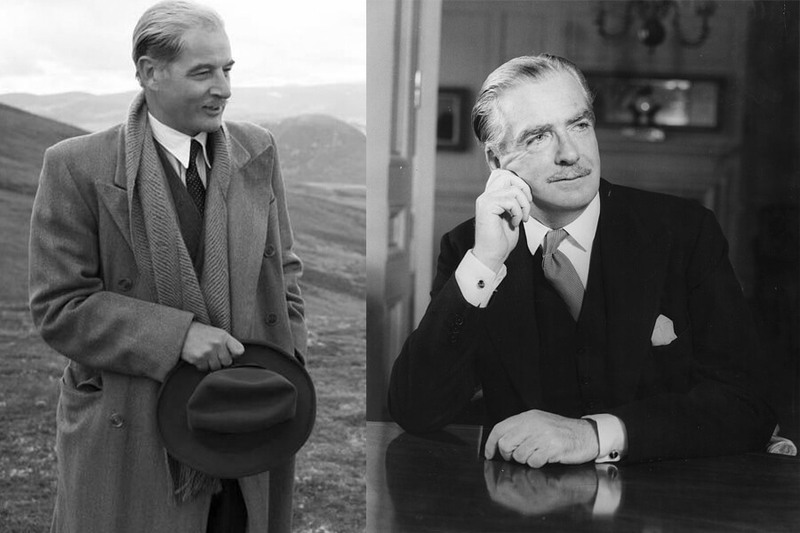 Next, good luck figuring out which Anthony Eden is the real Anthony Eden! Anthony Eden served three periods as the United Kingdom’s Foreign Secretary before becoming Prime Minister in 1955. On The Crown, he is brilliantly portrayed by Jeremy Northam, the man standing in a coat in the left picture. Did you guess correctly? During the time period the show takes place in, Eden was the Foreign Secretary and deputy to Winston Churchill. Jeremy Northam was born in 1961. By then Eden’s reputation was at a low point thanks to major blunders as Prime Minister that set the United Kingdom back several years. 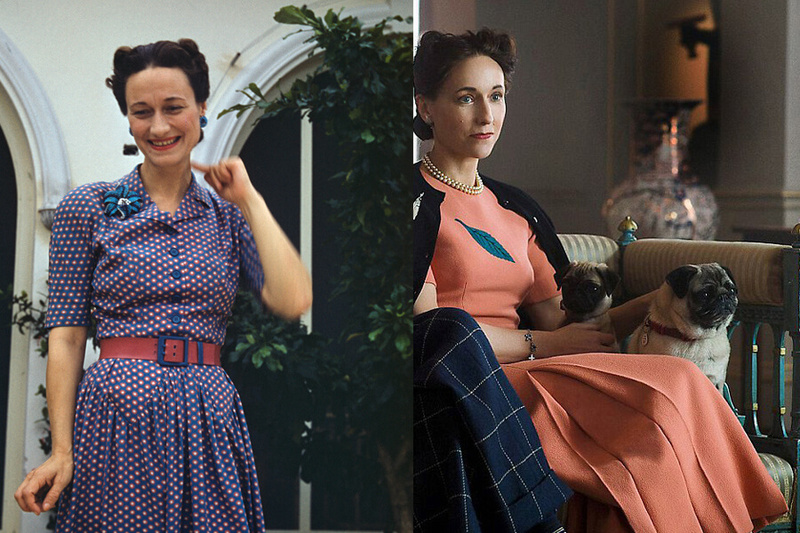 Wallis Simpson, as played by Lia Williams, is one of the most controversial members of the Royal family. After two divorces, she fell in love with and became engaged to King Edward VIII. The United Kingdom and its Dominions couldn’t stomach the King marrying an American with multiple divorces, forcing King Edward to give up his crown. When King Edward VI took over, he created the title of “Duke of Windsor” for his brother. Wallis Simpson, as his spouse, became known as the Duchess of Windsor. In the picture above, the real Duchess of Windsor is on the left. Ahead, is that Winston Churchill or John Lithgow? Figuring out which one is John Lithgow and which one is Winston Churchill shouldn’t be hard here. Churchill had a distinct look that isn’t easy to replicate. With a cigar in his mouth on the right, that is undoubtedly the former Prime Minister of the United Kingdom. On the left is John Lithgow, who earned a Golden Globe nomination and Emmy win for his portrayal of Churchill in 2016. The accomplished actor has also been nominated for two Academy Awards and one BAFTA Award. 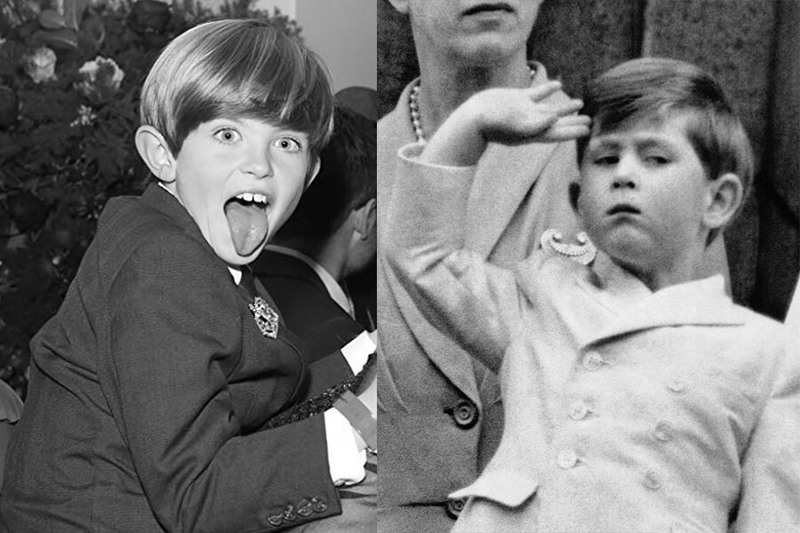 Prince Charles has come a long way since his time as a wee-lad. Here he is on the right, not looking excited about being a public figure. These days he’s waiting his turn to sit on the British throne as King. He’ll have to wait a while longer; at 92-years-old, Queen Elizabeth II is showing zero signs of slowing down. Billy Jenkins, the young actor on the left, looks like he’s ready to party playing the decorated Royal. The Crown was the first major role Jenkins was cast in. Showing acting skills beyond his years, this should be the start of a long and amazing career for him. Coming up, Jared Harris disappears into the role of King George VI. King George VI was born in 1895 and died in 1952. He served as the King of the United Kingdom and the Dominions of the British Commonwealth from 1936 until his death. In The Crown, Jared Harris plays the role of the King as he becomes ill and hands over his responsibilities to his daughter. 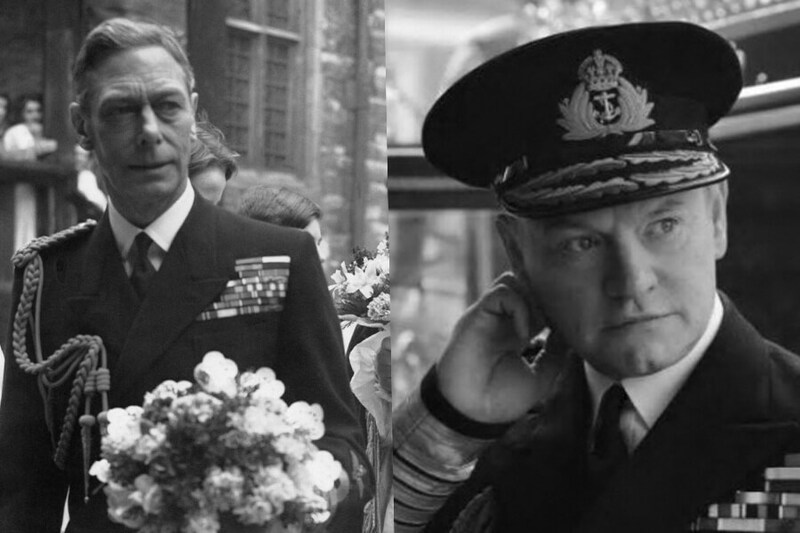 Jared Harris, pictured on the right, disappears into the role of King George VI. In 2017, he received a BAFTA Award nomination for his work. It was his second major award nomination, but first and only for The Crown. 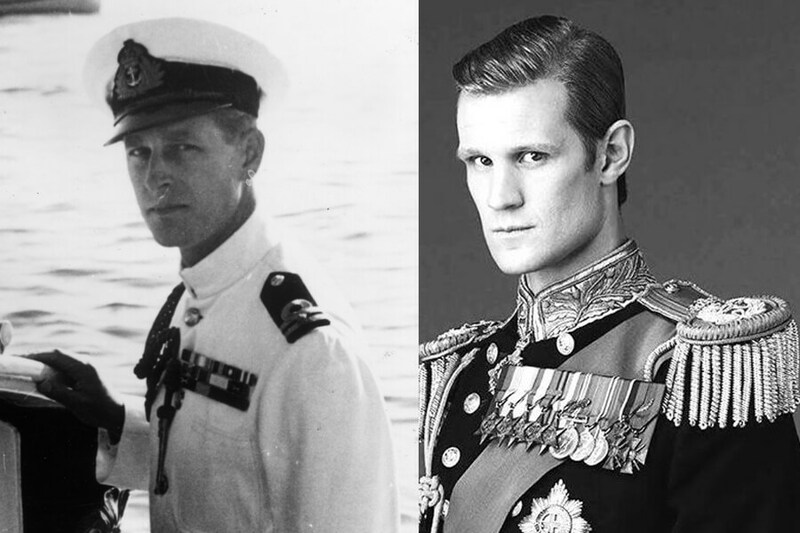 Two years after hanging up his hat as Doctor Who, Matt Smith took on the biggest role of his life playing Prince Phillip on The Crown. Prince Phillip, as you know, married Queen Elizabeth II in 1947 and has stayed loyally by her side ever since. Before being allowed to marry the future Queen, he was forced to abandon his title as Prince of Greece and Denmark. As a member of the Royal family, he is known as the Duke of Edinburgh. He looks pretty content with his decision on the left. Still ahead, you won’t be able to tell which one is the real Princess Margaret. 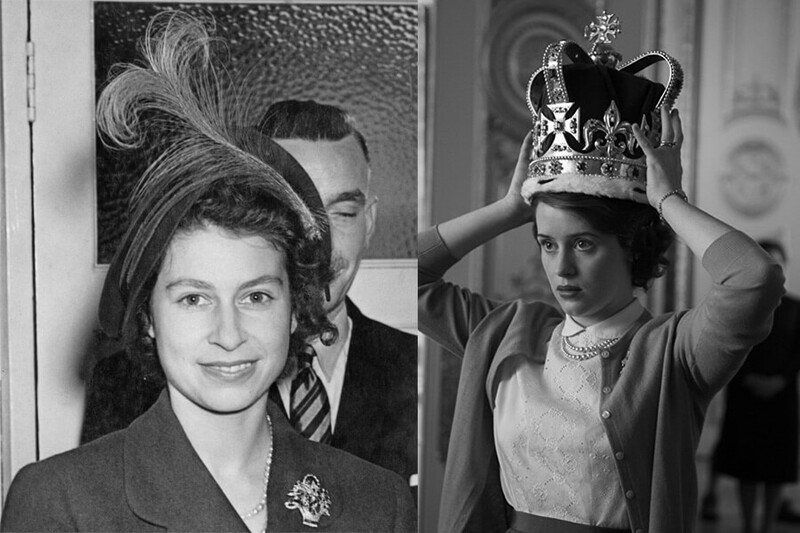 Princess Margaret, The Countess of Snowden, was Queen Elizabeth II’s younger sister. As portrayed in The Crown, Margaret fell in love with Peter Townsend, who divorced his first wife so he could marry her. The Church of England didn’t approve of the possible marriage and forced Margaret to break up with him. 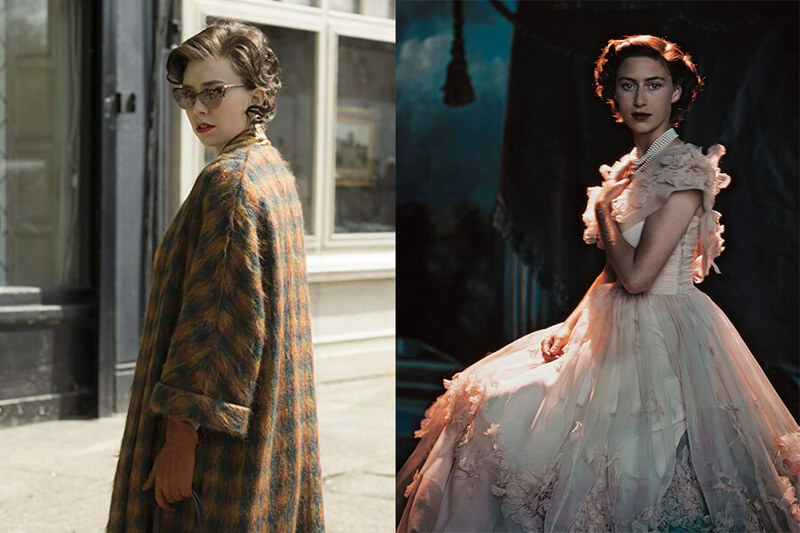 Vanessa Kirby, pictured on the left, looks like a mirror image of Princess Margaret. Since wrapping the second season of The Crown, Kirby has stepped away from period pieces to become an action star. In 2018, she starred with Tom Cruise in Mission Impossible: Fallout. 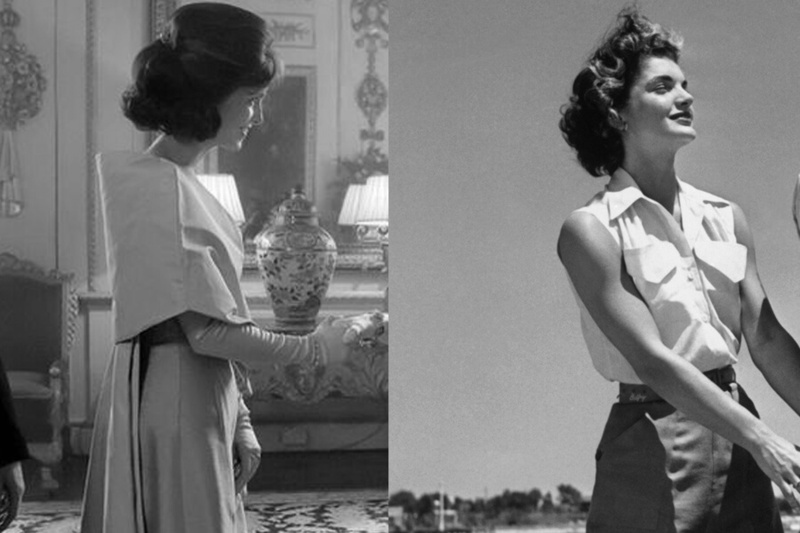 Jackie Kennedy was featured in one episode of The Crown, depicting her visit in London for a Washington Times-Herald piece. During her trip, she was dating John. F Kennedy, but it was not until she returned home that he proposed. In the picture above, we think it’s nearly impossible to tell who is who. Rest assured, the real Jackie Kennedy is on the right. Jodi Balfour, a spitting image of the former first lady, is on the right. She may have only been in one episode, but to The Crown, she’s a part of history and deserved to be treated like it.